My husband, Jim, who is kind of a geeky guy in the best of ways and really is interested in genetic genealogy from a technologist’s perspective, asked me a question about the new mitochondrial comparative sequence, the RSRS (Reconstructed Sapiens Reference Sequence). We’ve been talking about it on the blog and on the various DNA lists for days now. So it stands to reason we’re talking about it at the dinner table too. He asked, “Why now? Why not before when the transition would have been easier?” That’s a great question! The answer isn’t nearly as short as the question. I hate it when he does this to me! The answer is Citizen Science – that means you and me – lots of us actually. How is that possible? Let’s take a look at some history. It’s actually quite interesting! In 1981 when the Cambridge Reference Sequence was published as a comparative model, the science of genetics was functionally brand new. This anonymous person at Cambridge University was the first person to have all 16569 bases of their mitochondria sequenced, something anyone can have today for a couple of hundred dollars. But back then in the not so distant past, it was groundbreaking. The Y DNA hadn’t even been mapped yet, so this was the very beginning. At that point in time, there was no concept of mitochondrial Eve or Y-line Adam. So the CRS became the norm because we had no other basis for comparison. In 1999, the CRS was resequenced, and surprisingly, 11 errors were found in the original sequence. Today that is called the Revised Cambridge Reference Sequence, or rCRS, technically, and that is the sequence that is used for both academia and genetic genealogy. Most people just refer to it as the Cambridge Reference Sequence because no one would use the older sequence today. 1999 was also the first year that any commercially available genetic genealogy tests were available to the public. They were available from Oxford Ancestors and were prohibitively expensive, but that didn’t stop many of us from ordering one. 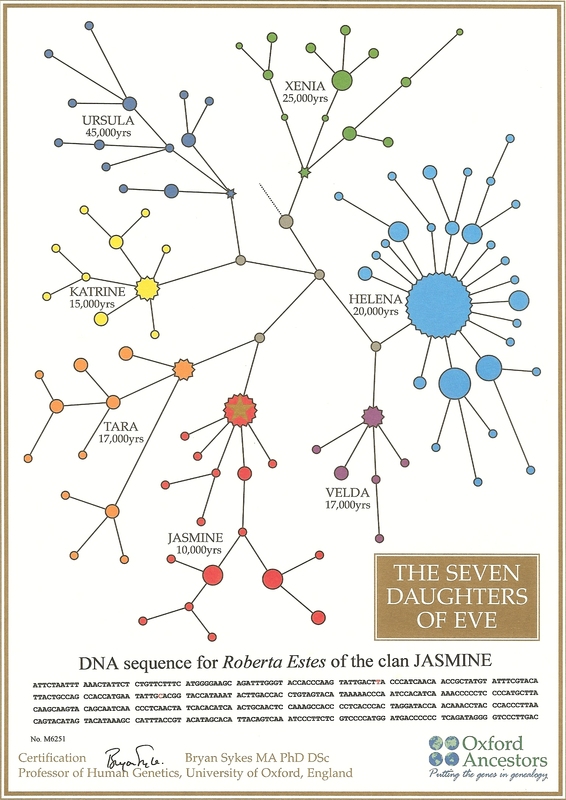 If you bought the book, “Seven Daughters of Eve” you could send in the form in the back of the book, with a hefty check, and you too could discover which of the 7 daughters you descended from. What you received was one piece of paper in the mail, months later, with a gold attendance star (like from Sunday School when you were a kid) placed on your haplogroup name. So for several hundred dollars, significantly more than a full sequence test today, I got a gold star on a J. I still have that certificate and I was unbelievably excited to know I was a member of Jasmine’s clan. Of course, in order to justify my DNA test, I had to test my husband’s too, so it cost me twice as much! In the year 2000, Family Tree DNA opened their doors and began selling genetic genealogy testing kits. They also began surname projects. I don’t know if that was a stroke of genius or a stroke of luck. Soon thereafter, they added both haplogroup projects and geographic projects. These various project types allowed people with specific interests to focus on those areas of genetic genealogy. Little did we know that projects would eventually provide a huge pool of people who have been DNA tested for research areas, such as determining new haplogroups. In the past all sequencing had been done at academic institutions and often did not use full sequences initially due to the prohibitive cost. Many of the early academic papers were written with far fewer samples than today’s projects have members. Full sequence commercial testing has fostered exponential change in this industry. By 2006, Family Tree DNA was offering the full mitochondrial sequence for genealogists, something still not offered today by any of the other major commercial testing companies. This not only enabled genealogists to determine who was actually a close match, but it also enabled the haplogroup projects to collect many samples of full sequence data. The coding region (meaning not the HVR1, HVR2 and HVR3 regions) is not shown in the public projects because of the possibility that they may carry medical information, but they are available for project administrators to see, if the individual participant authorizes administrator view access. Haplogroups aren’t just determined by the hypervariable (HVR) regions, but by mutations found in the entire mitochondrial sequence, including the coding region. Never before had groupings of participants this size been available outside of academia, and often, not even within academia. Bill Hurst has been collaborating with Dr. Doron Behar for several years now and is recognized in his most recent paper. They presented a joint session at the 5th International Conference on Genetic Genealogy for DNA Administrators in Houston, Texas in March of 2009. During this time, Family Tree DNA implemented an authorization system for people to make their full sequence DNA results, if they wanted, available to Dr. Behar for research. Dr. Behar’s paper (along with several other authors), “A “Copernican” Reassessment of the Human Mitochondrial DNA Tree from its Root” was published earlier this year, defining the RSRS (Reconstructed Sapiens Reference Sequence) revealing the genetic fingerprint of Mitochondrial Eve, the original mother of us all. He was able to do this, in part, as a result of the many full sequence test results made available by Family Tree DNA customers, you and me, and by the hard work of haplogroup administrators like Bill Hurst and Jim Logan. Of course, there are many other hard-working administrators too, and I don’t mean to slight anyone. So, this is a long-winded way to answer Jim’s question, which, in case you’ve forgotten, was “why now for the RSRS and why not before?” The answer is quite simply, Citizen Scientists were needed. People like you and me. Until the stars aligned where haplogroup projects existed, full sequence mitochondrial data became affordable and widely available, and there was a way for genealogists to contribute their results for scientific research, it couldn’t have been done – at least not yet. It’s been a long way from the gold star on haplogroup J to the beautifully elegant RSRS, the mitochondrial map of Eve, the common ancestor of everyone living today – the entire trip made in just a dozen years. Congratulations and thank you to everyone involved. Indeed, it’s really quite a remarkable story! This entry was posted in Citizen Science, CRS (Cambridge Reference Sequence), DNA Testing Companies, Mitochondrial DNA, Mitochondrial Eve, RSRS (Reconstructed Sapiens Reference Sequence) and tagged General Information by Roberta Estes. Bookmark the permalink. Roberta, Fantastic article and kudos to your husband for asking the question. It is also good to know the involvement of Citizen Scientists in this endeavor. Keep the great information coming!! Roberta, thank you for your clearly written story of how mitochondria sequencing evolved in recent years and its value to the scientic community. You are clearly one of the signigicant leaders in our Citizen Scientist community. Amazing blog and explanations! Thanks so much. Did Nat Geo also, and then went with 111 Y testing very interesting.